With this product, you earn 20 loyalty point(s). 20 points = $0.20. Welcome to view our YouTube Videos! AA-AP23122 and you will get this DSP board shown in Figure 1 or 2.
frequncy, besides that toggle the slide switch on board to mute or enable the audio output. 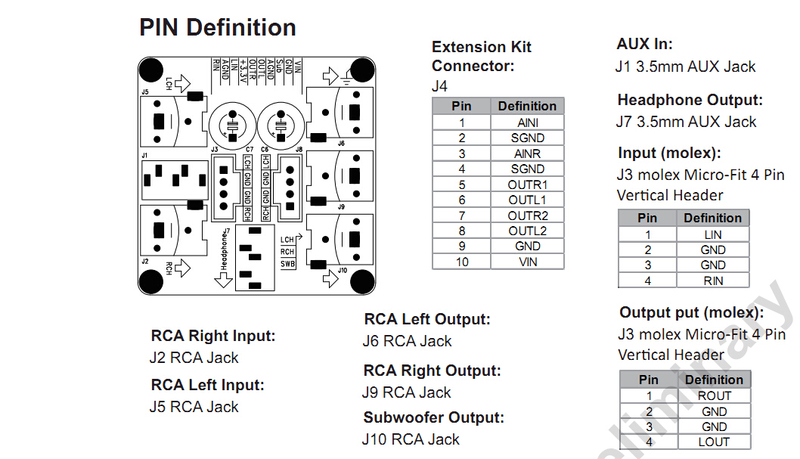 Select AA-AA11428 to get this interface extension board. This Audio DSP board employs the Analog Device ADAU1701 whose signal processing is compara-ble to that found in high end studio equipment. The dynamic range of its Two Σ-Δ ADCs and four Σ-Δ DACs reaches high up to 98.5dB. 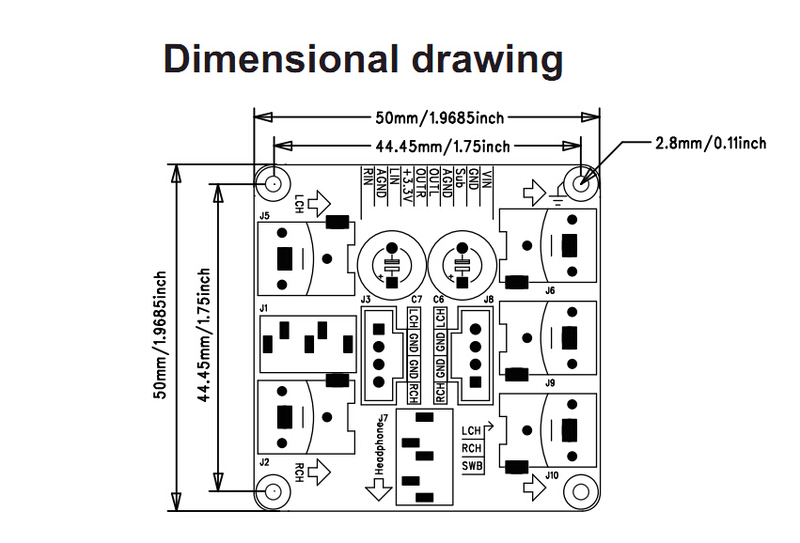 Each ADC has a THD + N of -83 dB, and each DAC has a THD + N of -90 dB. Besides, the optimal PCB layout of power filtering and signal loop as well as the capacitive compenents also contribute to the high sound quality. 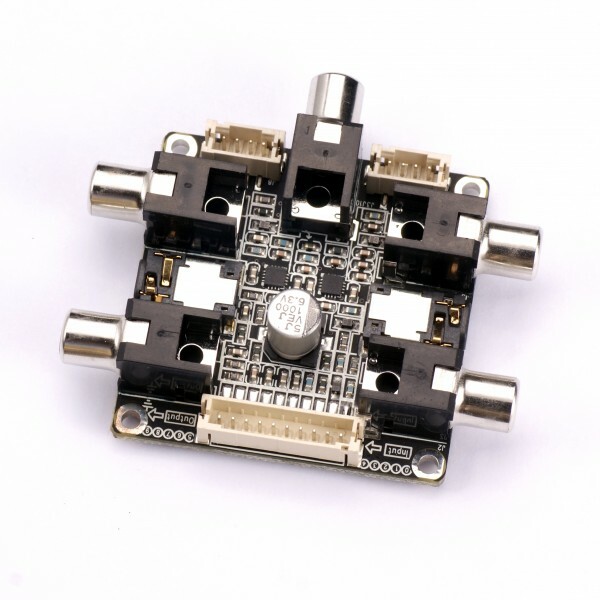 Selecting a proper audio DSP module for DIY applications with reasonable speed, cost, precision, data word length, I/O capabilities and SNR is not an easy task usually, especially when budget is only several or tens of dollars. A simplest but available DSP system will only cost you $9.99.The Audio DSP board serves as a cost effective platform for those new to the digital signal processing with interest in digital audio. Simple connection but rich potential configurations and low cost without hidden cost but high performance are the reasons of the affordable price. focused application, using Kernel Audio DSP board is a turn-key approach to the system develop-ment that free up your development resources to focus on the global performance instead of spending time developing the audio DSP.All the necessary interfaces have been rearranged according to signal chain and the programming requirement. With the headers or a 10 pin cable, the kernel board will be integrated to the mother board quickly. questions, please contact our technical support. interface in order to avoid plug-in play damage to the ports. SigmaStudio graphical tool. Besides, it has 4 potentiometers on board for more functions. 500 pieces. Feel free to contact with info@sure-electronics.com for more detailed information. help you build and deploy signal processing systems quickly and efficiently. debugging and programming may be implemented flexibly. Sure Electronics can provide customers with Analog Devices EVAL-ADUSB2Z for programming. A 10Pin to 6 Pin cable will be provided for easy connection. The Programming kit costs $99.9. Sure Electronics can also provide another programming device which provides a high cost ratio solution for customers. Please feel free to contact with info@sure-electronics.com for more detailed information. Sure Electronics can provide programming service for OEM customers, 500 pieces MOQ and engineering cost will be requested. Please send your requirement document to info@sure-electronics.com for conﬁrmation. Sure Electronics has released one interface exten-sion board to provide a simple connection solution for customer’s applications. The extension board only costs $4.99. 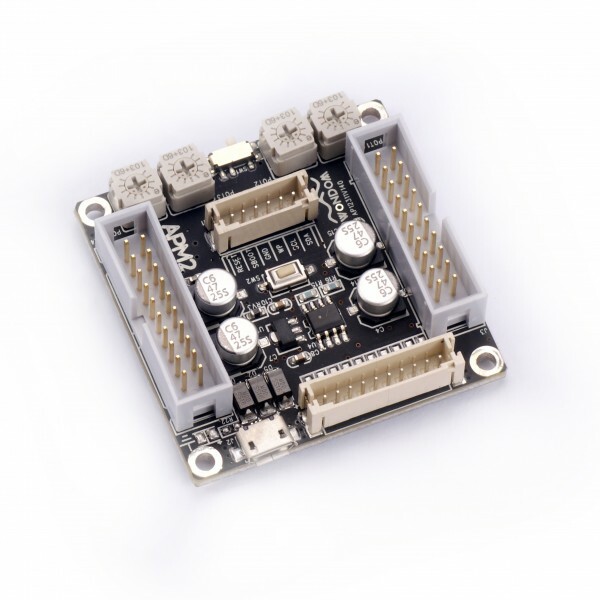 Interfaces on board include 2CKT RCA input jacks, 2CKT RCA output jacks, 2CKT 3.5mm AUX jack, 2CKT molex Micro-Fit vertical headers.With the headers and a 10 pin cable, the interface extension board can be integrated to the DSP Kernel board quickly. For more detailed connection informa-tion, please refer to “Connection” chapter. How to connect audio DSP kernel board with interface extension board ? All useful Pins of ADAU1701 have been included in 2 sockets on both sides of Kernel board. 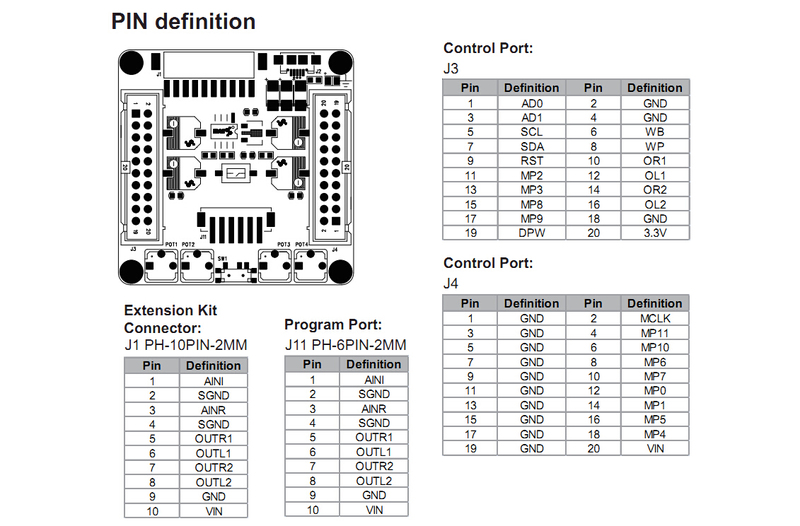 It is easy for customers to integrate this board into their projects. 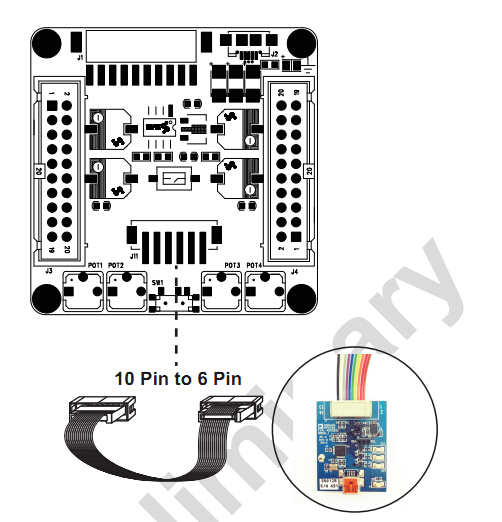 A 10Pin terminal on board is also provided to connect with Analog Devices EVAL-ADUSB2Z for programming.Choose our extension board for more generic connector interfaces. 2 pieces RCA and a 3.5mm AUX jack are provided for input, 3 pieces RCA and a headphone jack for output. Also Molex 4Pin terminals have been provided on board for more complex application solutions. 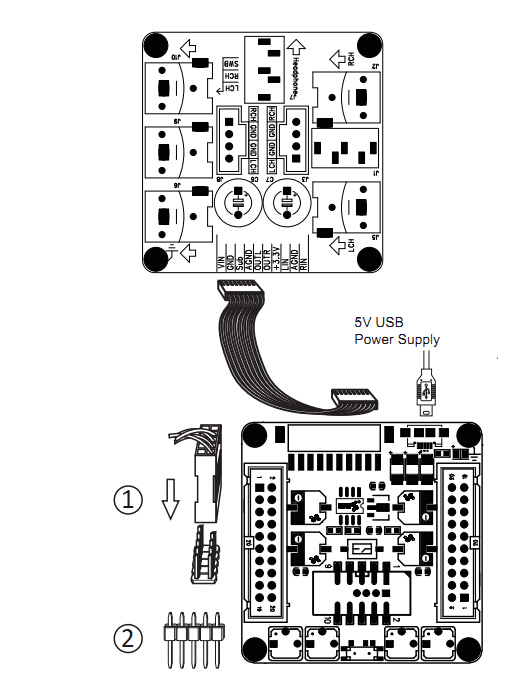 A 10Pin extension cable which is attached with extension kit package is provided to connect these two boards.Installation kit is also help for a quick connection and convenient programming.